Due to varied Indian climatic conditions we are gifted with diverse cuisines!Sure,it is a greatest gift for a person like me who have a great craving to explore varies cuisines which has a wide array of incredible color and flavorful food. Rajasthani cuisine is a wonderful and aromatic cuisine particularly the vegetarian varieties made are vast!each and every dish has something intense and they are sinfully tasty!not to be missed.In this post am totally enthused to travel through one of the famous Rajathani (marwari) delight named ram pulao(recipe of gatte ka pulao)Gatte ka pulao.When relishing the pulav the in-between munch of the gatte or besan dumplings is the character that makes Gatte ka pulao /Ram pulao/Kitchidi a special one.I got inspired to make this recipe from varevah.com.The dumpling made out of besan for this should be soft!so,should be fried moderately crisp. 1.Soak basmati rice for half an hour and cook the with salt(can add little oil while cooking) and spread the cooked rice in a plate and add some ghee so that the rice does not stick and transfer it into a bowl and keep ready. 2.Then for the gatte/dough make coarse powder of coriander with chilli,turmeric powder,asafoetida and salt added to it and take in a bowl. 3.In between boil water in a pot. 4.Add gatte powder in a bowl combine curd,besan and some oil together by sprinkling some water,the dough should be stiff.Now roll the dough to even cylindrical shapes and add this to boiling water and close the lid,let it boil for 10 minutes and take it out and cool,cut into little circles and fry the pieces in hot oil. 5.Take out and keep it ready. 6.Then make a powder of cumin,cinnamon and cloves. 7.Now keep a kadai add ghee and add cinnamon,cloves,cumin powder and then add cashews and raisin when the cashews are brown add boiled peas to it. 8.After that add turmeric,chilli powder and salt and mix. 9.Then add the fried gattas to it with some chopped coriander. 10.Add the boiled rice to it toss it nicely till well mix and at this stage sprinkle some water(little) and close the lid for 2 minutes and switch off,mix well and serve with boondi raita or any raita. Soak basmati rice for half an hour and cook the with salt rice and spread the cooked rice in a plate and add some ghee so that the rice does not stick and transfer it into a bowl and keep ready. Then for the gatte/dough make coarse powder of coriander with chilli,turmeric powder,asafoetida and salt added to it and take in a bowl. In-between boil water in a pot. Add gatte powder in a bowl combine curd,besan and some oil together by sprinkling some water,the dough should be stiff.Now roll the dough to even cylindrical shapes and add this to boiling water and close the lid,let it boil for 10 minutes and take it out and cool,cut into little circles and fry the pieces in hot oil. Take out and keep it ready. Then make a powder of cumin,cinnamon and cloves. Now keep a kadai add ghee and add cinnamon,cloves,cumin powder and then add cashews and raisin when the cashews are brown add boiled peas to it. After that add turmeric chilli powder and salt and mix. Then add the fried gattas to it with some chopped coriander. Add the boiled rice to it toss it nicely till well mix and at this stage sprinkle some water(little) and close the lid for 2 minutes and switch off,mix well and serve with boondi raita or any raita. Don't fry the gatte too crisp and roll the dough evenly so that you get evenly cooked gatte's. The water for boiling the gattes should be bubbling when you add them. When boiling rice add little oil so that the rice doesn't stick. If you want it to be spicy add up the chilliness as per your need. The dough you are making should be nice and stiff which makes perfect gatte's. I have powdered cumin,cinnamon and cloves according to my family need you can add it without grinding. Coriander seeds should not be finely powdered,should be ground roughly. Such a wonderful post dear. 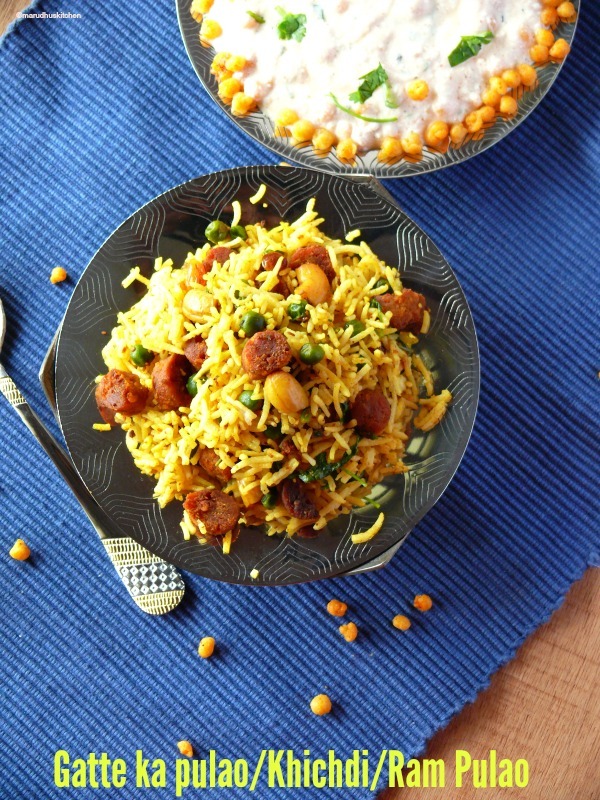 So beautifully explained that one can easily understand the techniques and nitty gritties to make this delectable rice dish. I can imagine the crunch from the gatte and the aroma from the rice and to top it your super Delish boondi RAITA for accompaniment. I wish I was invited for this meal. I feel as though I can grab the bowl straight from the pictures dear Vani. such clarity in the pictures. simply wonderful dish. 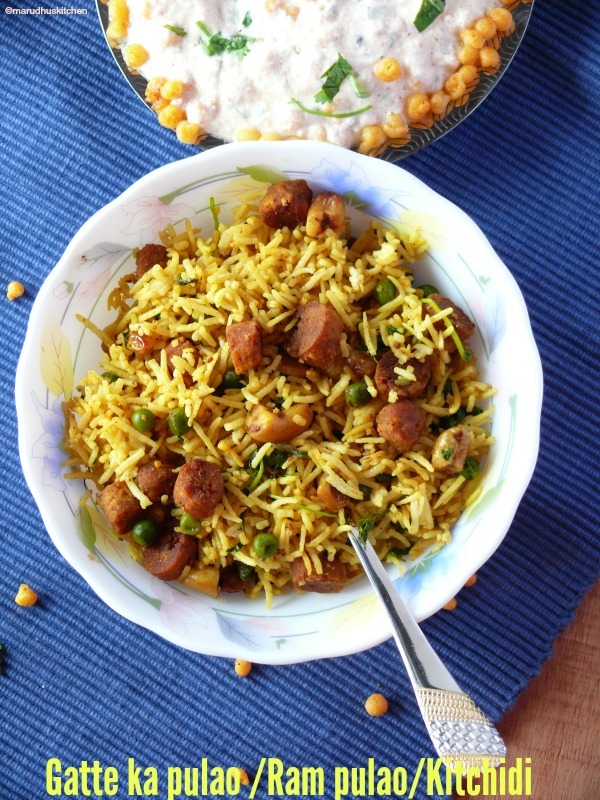 beautifully made gatte and pulav and beautifully presented. thanks for sharing such awesomeness at the blog-hop Vani. I never knew it was also called Ram Pulao.Learnt something new today. Very nice reipe. Step by step pics are really helpful. Thanks for sharing such a nice recipe. Thank you for this recipe. I always wondered how to prepare rice that way.